Pruning flowering trees will keep them from getting too lanky and prevents them from being damaged by ice storms. This is a Kwanzan Cherry. This is a flowering crabapple. 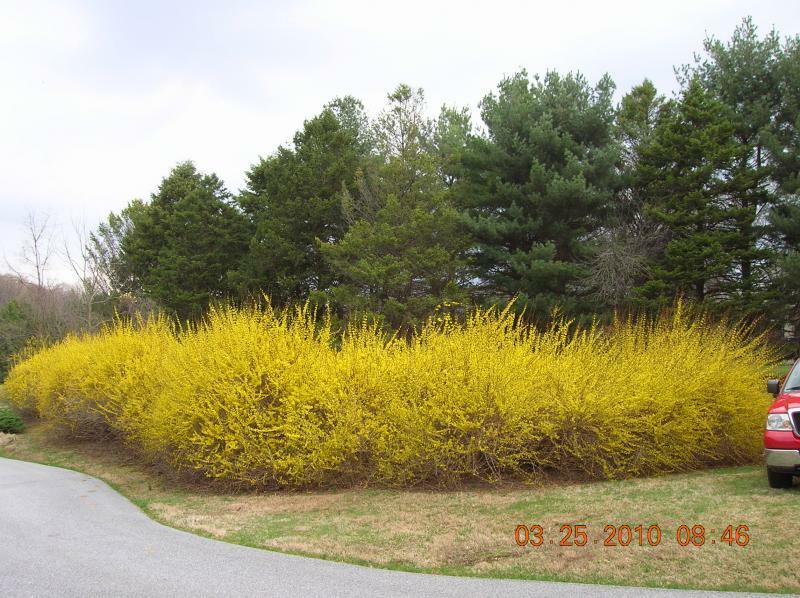 These Forsythia were pruned while blooming (customer request). I like to cut them in mid-Summer. When Spring comes they will give a fountain effect when flowering but not be so long as to look rambling. This is what they look like now. This photo was taken just before pruning. This is what the same area looked like last Spring. Here are the same forsythia from a different angle. 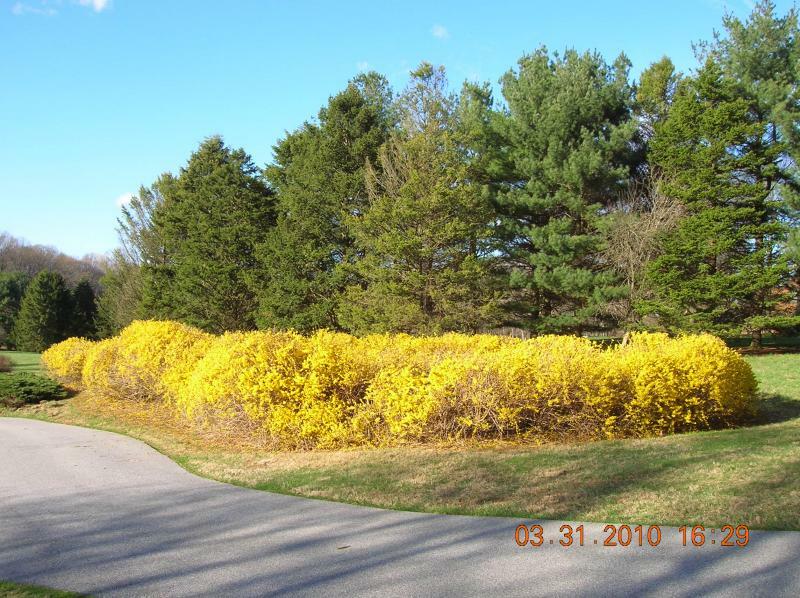 This row of forsythia is 75ft long ,14ft high, and 25 ft wide. They had not been pruned in close to ten years. 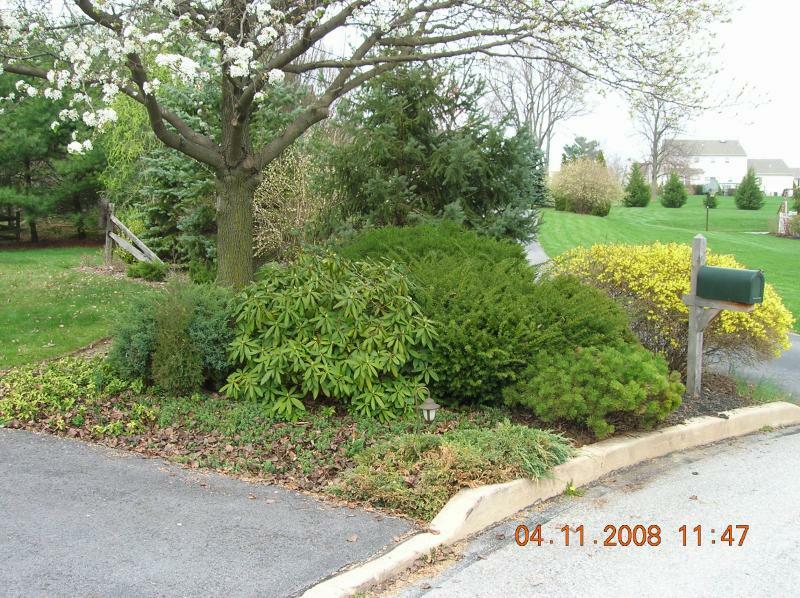 This is the same area just two months after the initial pruning. There was more growth than usual that year due to excessive rain. 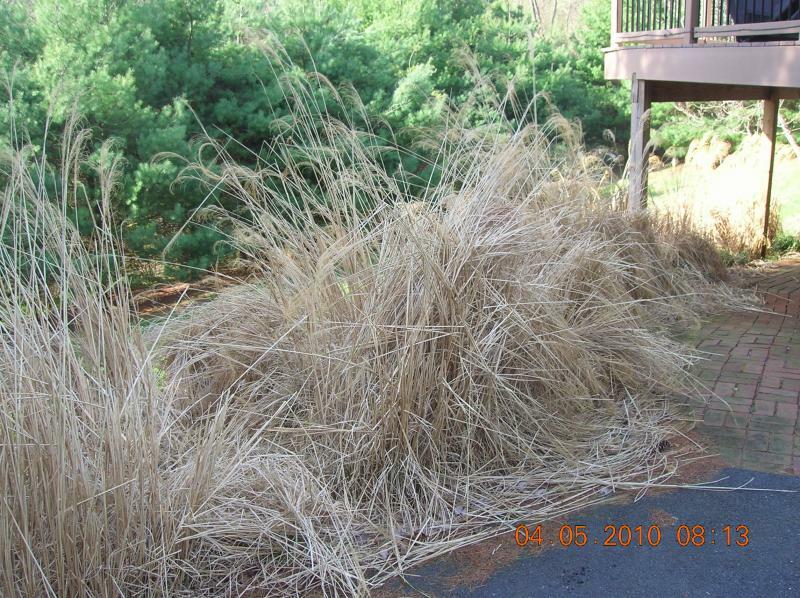 Perennials such as ornamental grass grow vigorously and need to be cut back every year before the new growth starts. 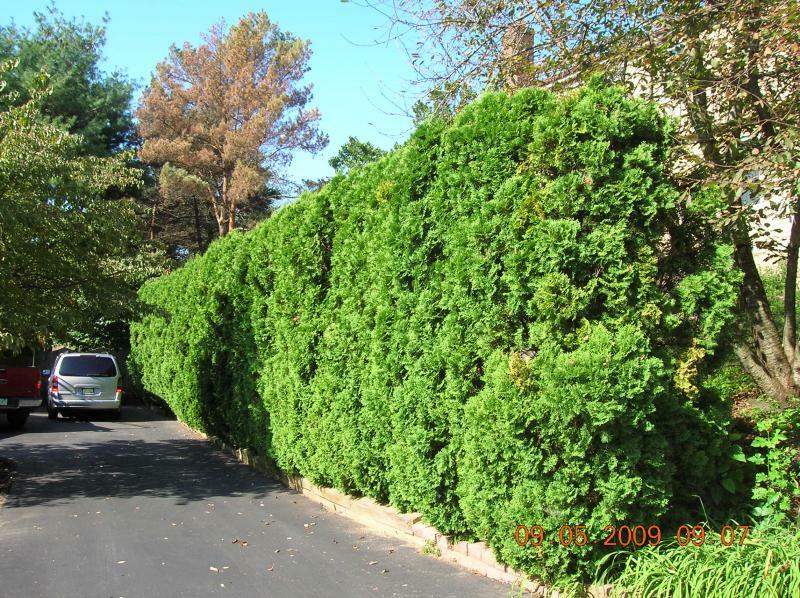 These arborvitae in Hockessin are 12' high and 7' wide. I used hand shears on them so as not to burn the foliage. Using hand shears yields crisp results. 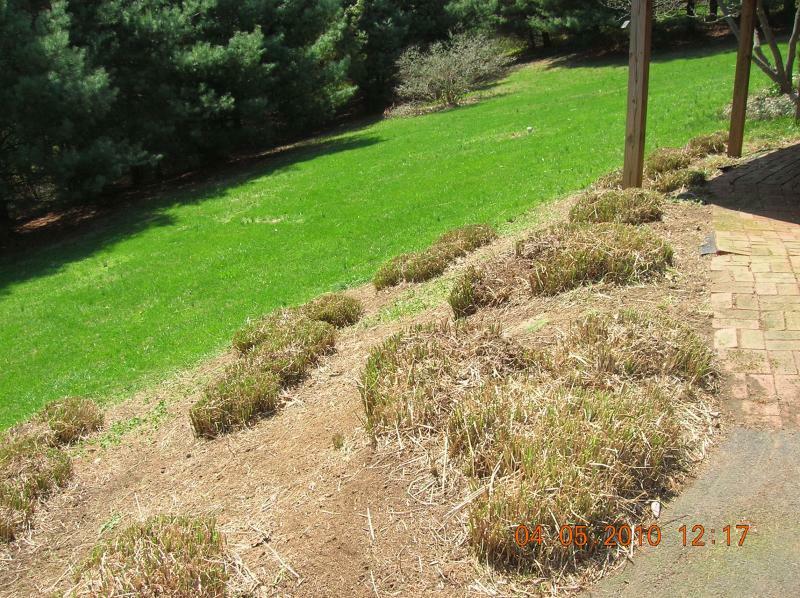 These juniper in the island of a driveway circle have grown out onto the driveway surface. They can be pruned hard and while doing so will have all the dead pieces removed. 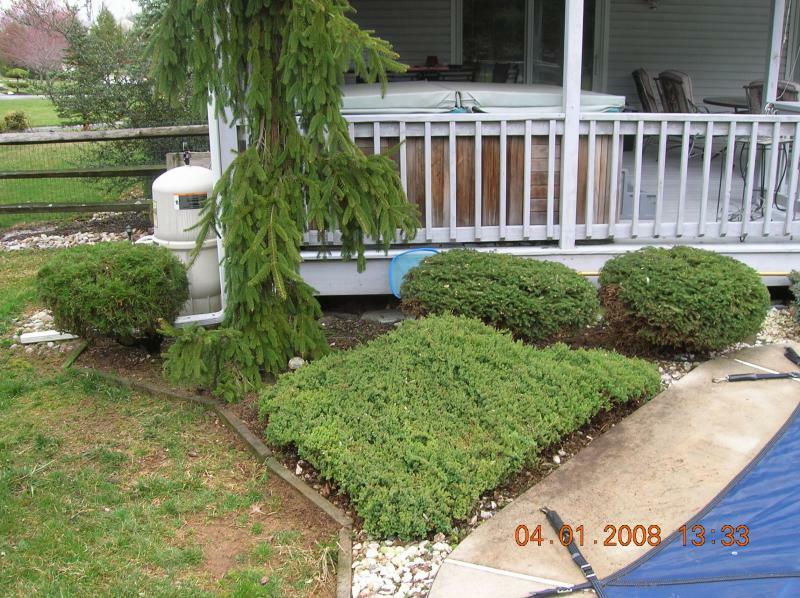 The other shrubs will be trimmed back. The walnut saplings and other nuisances will be pulled out. If that is not possible they will be sprayed multiple times with weed killer. The after trimming photos were taken about a month later. You can see the new growth due to all the rain. 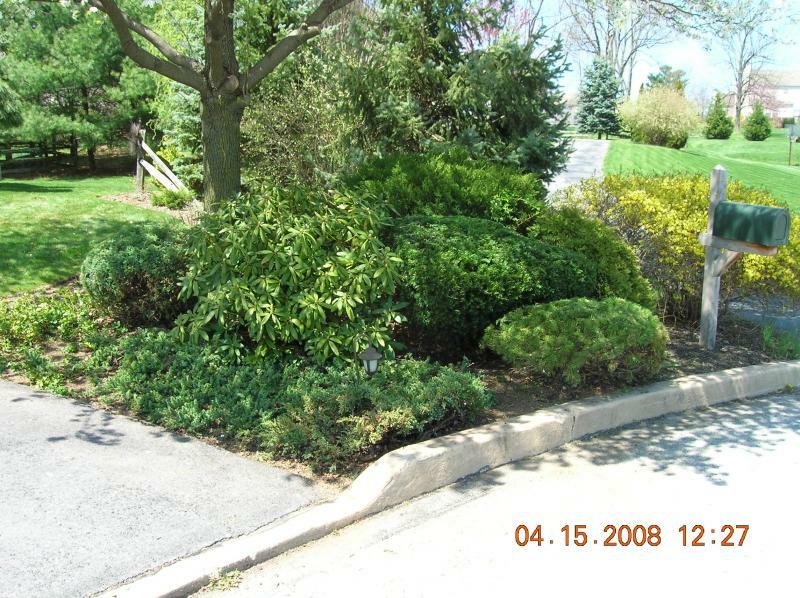 Across the driveway are other shrubs that require pruning. In the back one can see massive wild roses, honeysuckle, and creeper vines (top center) that will kill off the good shrubs if they are not eliminated. Again, more hard pruning and vine removal. This is the backside of the driveway circle. 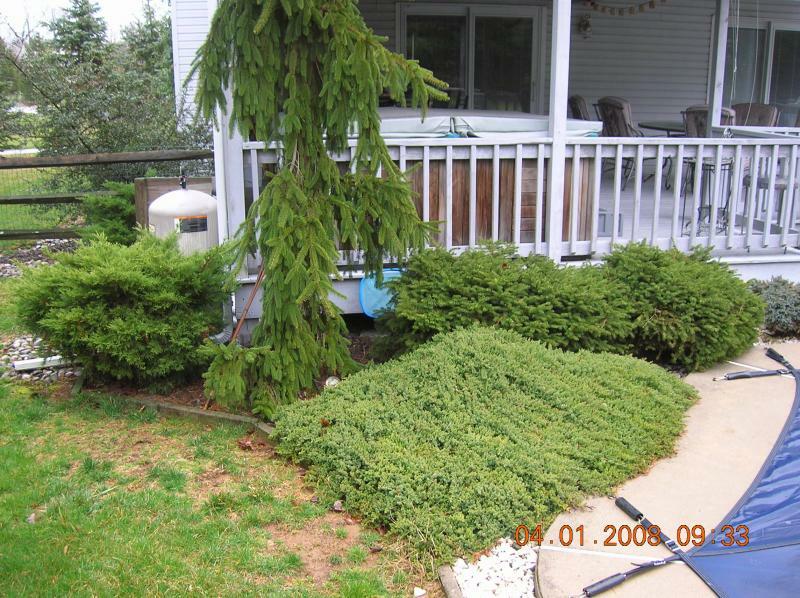 Arborvitae are tricky to prune. They do not grow back readily if branches are removed. 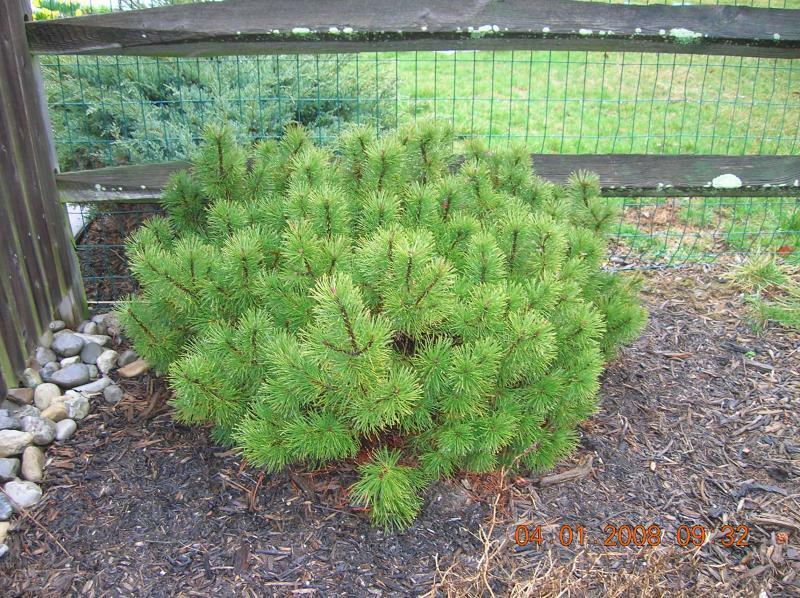 The foliage must not be cut deep, otherwise the shrub may turn brown. These were pruned by hand shears. It takes a little longer but results in a much sharper finish. *Beware of Bagworms! 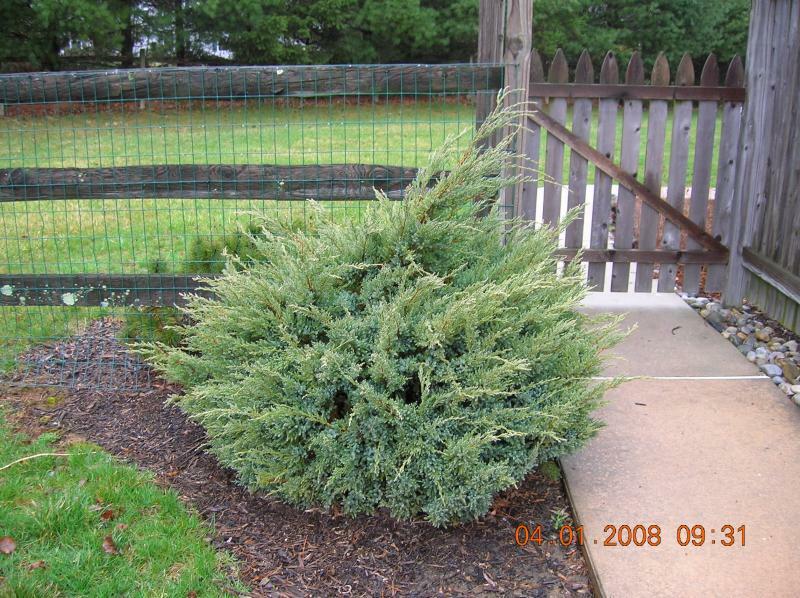 They attack in early summer and love arborvitae. This weeping cherry has over-grown the walkway and was so thick, light was blocked from ground foliage. Random cutting on this tree will cause a mess the following year. I step back and look to plan my cuts many times. Balance is key. Now that the tree has been shaped and thinned, the walkway is no longer obstructed. No need to duck here. 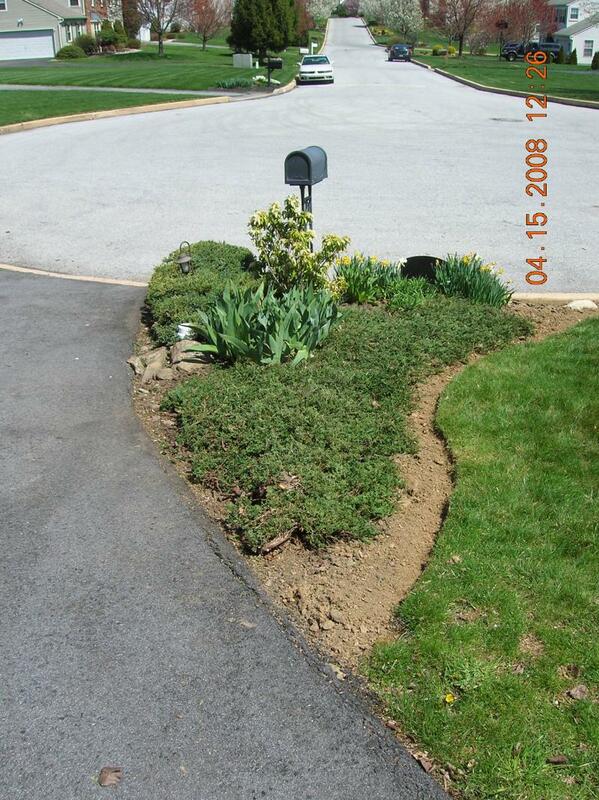 The shrubs below are standard. 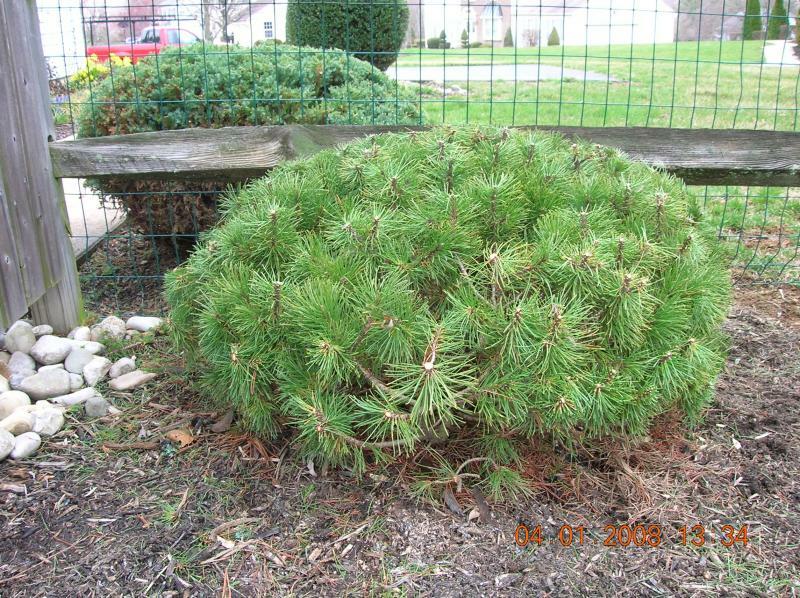 They need pruning so they will not get any bigger than what they are. Some people prefer rounded cuts. Other people like a natural pruning done by hand that will hide the cuts and not look snow-balled. Cutting each sprig by hand takes longer but may yield more desirable results. Pruning by hand takes longer, however, the results last much longer. I prune according to what the customer prefers. The blue carpet in the lower middle had the edges pruned by hand to look good along the sidewalk. The top was rounded with shears. 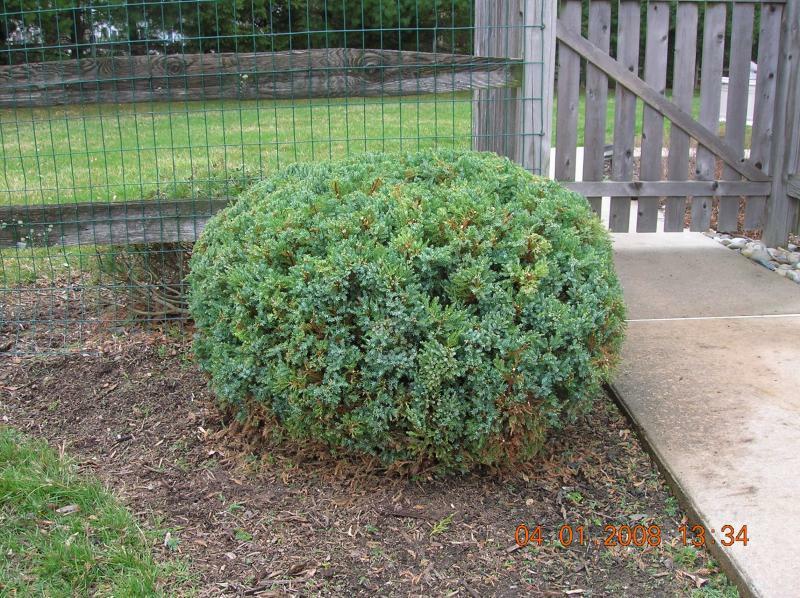 If this shrub was given a space all its' own, it would require little to no pruning. Below is a small bed that needs a clean-up...pruning, edging etc. 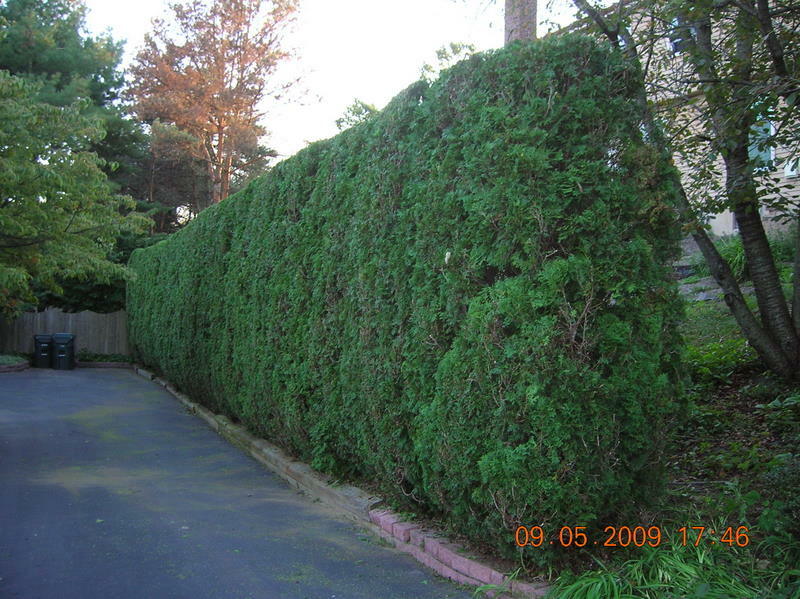 I pruned it back to a manageable state that will allow it to be easily maintained . 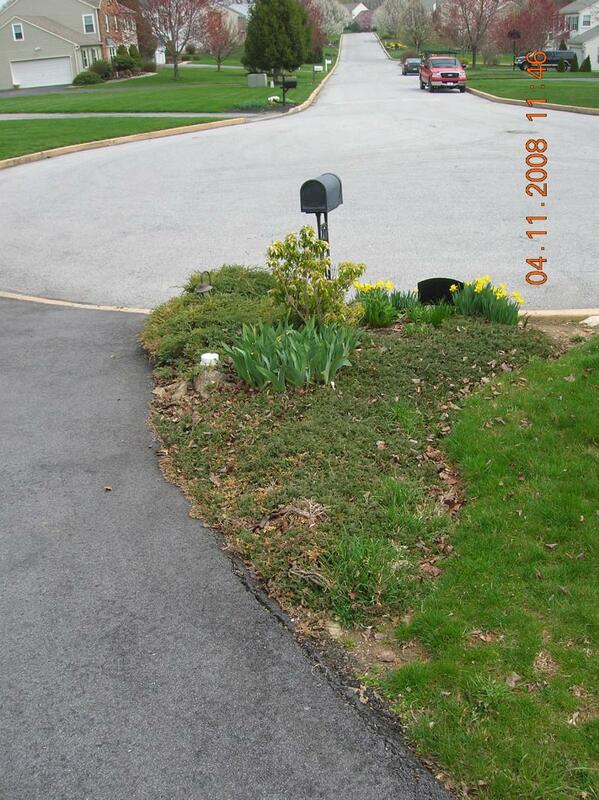 The bed below is on the opposite side of the driveway and needs the same treatment. I always prune Rhododendrons one branch at a time. This keeps the leaves from getting burned up where they have been cut..